Look what came out of my GIRAFFE! These dark nebulae are seldom imaged and I could not find any reference for them, so I was literally shooting in the dark -- but it looks like I found them. This is a small spiral galaxy behind a dense star field. In fact, it looks like somebody fired a celestial shotgun full of rock salt at it! I tried to de-emphasize the stars to see the galaxy better. 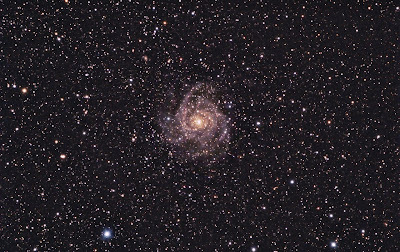 Another beautiful spiral galaxy. It is in a less populated star field. I love how two of the faint spiral arms terminate in a conjunction with the two colorful stars. All of these images were taken with my TAK FSQ 106ED and QHY8 camera, approximately 3 hours each. For the two galaxies I used (for the first time) an Extender Q lens that converts my TAK scope to a longer focal length F/8. I was VERY impressed with the job it did! I had beautiful clear skies last week at the Ranch and shot many more targets. The only bad thing is Kim and I lost one of dogs -- little Ponce. He ran after a deer and got lost. We stayed all week but never found him. Actually a Moon Ring (but it is kinda moody). 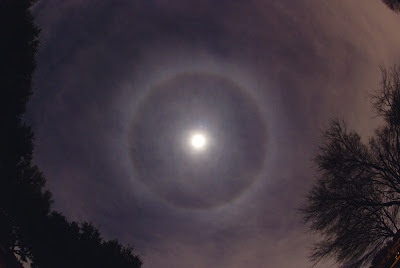 This was a huge 22 degree ring around the moon here in Dallas on Sunday night. 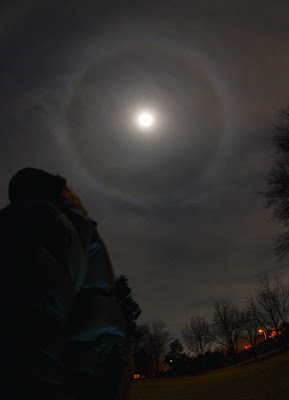 I have seen small halos around the moon, but never anything as large as this! This type of ring is created by ice crystals that form in the upper atmosphere. All of the ice has the same crystaline structure and refracts the moonlight like a giant lens, creating a very impressive ring. I took these images in the park across the street from my house, using my Nikon D-80 and Nikor 10.5mm Fisheye lens. It is a 3 second F/7 exposure at ISO 800. Here is another image I took from the Ranch over Christmas. 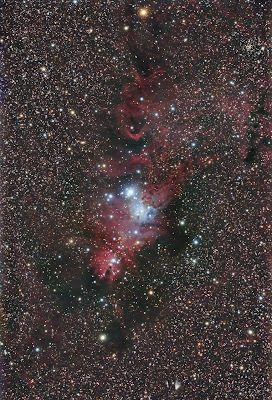 This is the Cone Nebula, otherwise known as NGC 2264. Actually, the Cone is seen as the small conical nebula at the bottom of the larger red dust complex. This entire complex (and associated star cluster) is referred to as the Christmas Tree -- so I of course had to image this over Christmas! 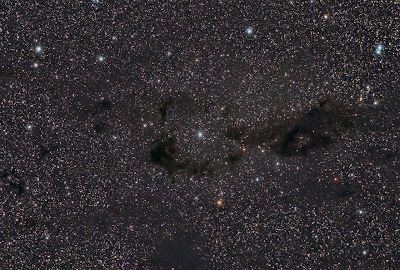 I really like this field -- lots of red emission nebulae, but also blue reflection and dark nebulae. Also, there is an additional treat -- Hubble's Variable Nebula (HVN). How Does Orion Keep his Pants up? The Orion constellation is the most identified group of stars in the heavens. It also filled with tons of "eye candy" -- the most noted being M42 (the great Orion nebula) and the Horse Head nebula. But Orion is actually FILLED with all sorts of intersting objects. Orion's Belt is easily recognized by naked eye as three bright stars close together in Orions "mid-section". For this image, I wanted to focus on this belt and bring out all the dusty bits around this area. There is a LOT to see here! 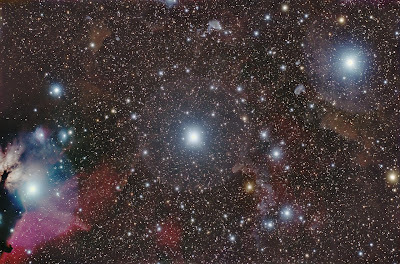 You will notice the Horse Head and Flame nebulae are in the bottom left corner. They were the focus of another recent image I took. But this time all focus is on the Belt. I am hoping to continue plundering Orion's treasures and create a large mosaic of the area. Kim and I (and the dogs) went to the Ranch for Christmas. We spent about a week in the Hill Country and I was able to do a lot of astro imaging of course! In fact, I was able to test my new scope and give it "first light". Christmas Eve was crystal clear and beautiful. 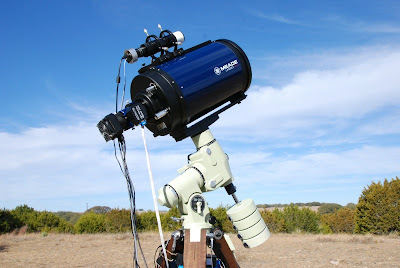 I set up the new LX200 10" and Borg guide scope. I did not have too much time, since we were going to be getting up early on Christmas morning to drive to Austin for Christmas day to visit family. 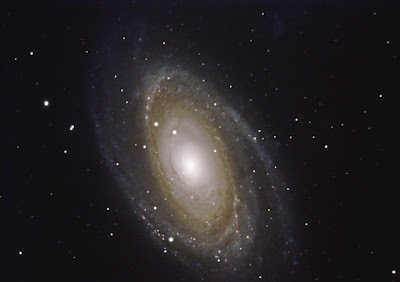 Anyway, I decided to go for Bode's Galaxy -- a classic spiral galaxy that is fairly large and bright. Everything went surprisingly smooth for a first run with new gear. One thing I learned quickly -- everything is much more difficult at longer focal lengths! For the past few months I have been doing wide field imaging with the Takahashi FSQ 106 with a focal ratio of F/5. But the new LX200 is a much narrower field at a focal ratio of F/10. What does this mean? Well, it means that any slop or error is amplified and becomes a much bigger deal. It also means that the "seeing" (rippling atmosphere) plays a much bigger role. One thing that became immediately clear is that my guiding needed to be REALLY spot on. This means you have to tweak it a lot to get it just right. This was a little difficult since I could not bring the Borg guide scope to exact focus (I need an additional spacer ring). So, I guided on soft focus stars -- but I got it to work. 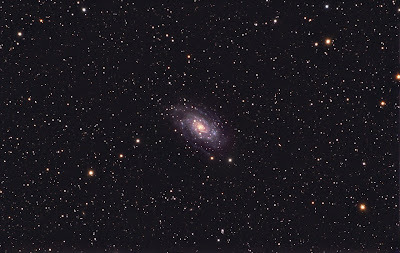 So here is the first image from the new system -- Bode's Galaxy. It is just under 2 hours of exposure. I still need to address a few things with this rig, but overall I am really pleased with my initial results. I can finally go after some "tiny" galaxies and planetary nebulae -- yea!